'Emma Louisa' (Eugene Buckles, R. 1968). Seedling 65-1. TB, 30" (76 cm), Early midseason bloom and rebloom. Color Class!B4RV, Standards light lavender-blue; falls red plum. 'Gypsy 'Lullaby' X 'Memphis Lass'. Buckles 1969. From AIS Bulletin #193 April 1969 Introducing EMMA LOUISA. Sdlg. 65-1. TB. 30". 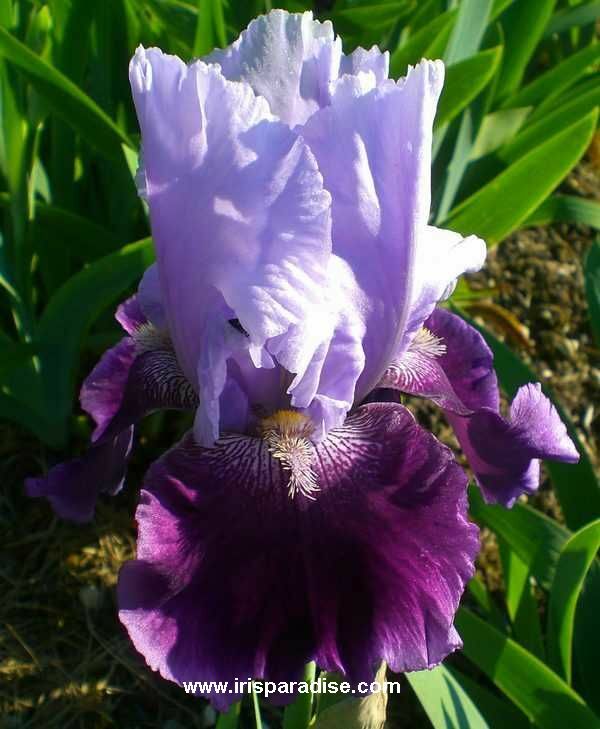 E-M. Domed standards are light lavender blue; falls dark red-plum, semiflaring and ruffled. Strong stalk, well-branched. Bud count 8. Will rebloom. Gypsy Lullaby X Memphis Lass. He '66. Net $25.00. Buckles Iris Gardens.